Handmade jewelry is a hot item for DIY bloggers. 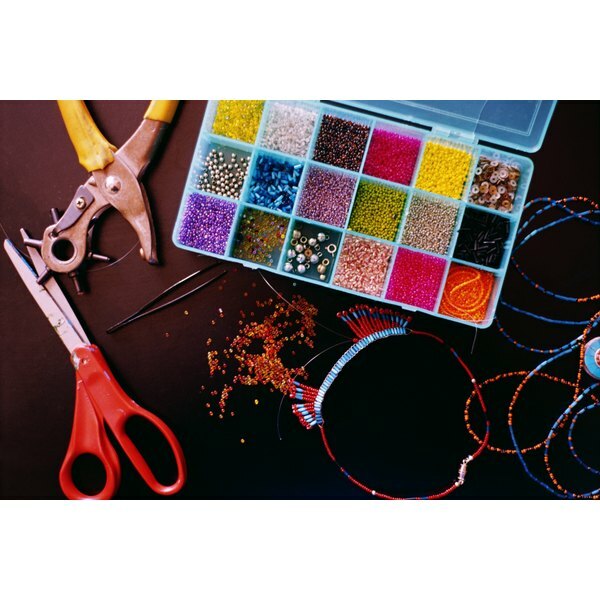 With the economy still struggling and many of us trying to stretch our fashion budgets to the max, do-it-yourself style is more popular than ever. It's become all the rage to make beautiful new things out of affordable or recycled items. A slew of DIY bloggers have emerged, showing us, with some creative flair and resourcefulness, how to make our own designer-inspired clothing and jewelry, and how to craft our own jewelry designs using things we probably already own or can purchase inexpensively. Their creative ideas prove that it's cool to be frugal and find our own inner DIY designer. If I see a cute tank top, my first thought is not about buying the tank, but of how I can make it out of a T-shirt that I already have. What if you only had a one dollar a day clothing allowance for a whole year? For some of us, this has become an unfortunate reality, and for the fashionistas among us, a radically reduced retail budget can seem cruel. However, when Los Angeles-based Marisa Lynch was laid off from her job, she set about turning the situation to her advantage. Inspired by the film "Julie and Julia," about Julia Child and a cooking blogger, Lynch decided to start her own blog, Newdressaday.com, in which she would wear a different outfit and spend no more than $1 on her clothing each and every day for a year. Armed with her trusty sewing machine, Lynch repurposes used clothing with creative techniques to fit her figure and style. Newdressaday.com, started in November 2009, has become a creative resource for those looking to squeeze the most from their closets. Certainly, saving money provides a better feeling than the guilt of buying something you genuinely can’t afford. "I've always repurposed clothes," Lynch said in an interview. "But I only did it when I had free time, which was every month or so. Making a new piece of clothing daily clicked for me." Lynch has loved DIY since she was young. "My first ever DIY project was the purse I wore to my senior prom," she remembered. "I found an article in 'Sassy' magazine with a DIY for a small handbag. I didn't like any of the bags that were out there, so I got some fabric and ribbon and made my own. It was amazing; totally unlike any of the other ones and I adored it. Of course, I still have it." Now Lynch can count designer and TV personality Nate Berkus and actress Tori Spelling among her fans and has been in "Time" magazine and listed among "Los Angeles Magazine's" tastemakers. She was even featured on E!, making one dollar bridesmaid's dresses for the sisters in the Oscar-winning movie "The Fighter." For those looking for extra DIY inspiration, Lynch says she gets hers mostly from magazines and classic movies. "I’m an avid magazine subscription holder and love paging through the latest issues of 'Vogue,' 'Lucky,' 'People StyleWatch,' 'Bazaar' and 'W,' " she said. "I tear out pieces of clothing, color schemes and accessories that I love and tack them to my inspiration board. I love seeing what celebs are wearing on the red carpets as well as looking at runway shows. I also watch old movies on Turner Classics." Lynch's first book -- title to be announced -- is to be published in the fall of 2012 by Random House. Most of us have plenty of old T-shirts lying around. Maybe we sleep in them or use them for workouts, but after viewing Megan Nicolay’s blog Generation T (generation-T.com), you’ll be resurrecting your old shapeless, rejected tees and seeing them anew as treasures. "Generation-T.com is a forum in which to learn about and educate other like-minded individuals -- and T-shirt lovers -- in Zen and the art of T-shirt slashing," Nicolay said in an interview. "All of the projects are designed and created by myself or by readers and other rogue fashionistas." Inspired first by her father, a potter and fine arts teacher; and her mother, a photographer and clothing designer, Lynch began her DIY T-shirt mission using batik when she was nine years old. In 2005, the now Brooklyn-based Lynch, launched Generation T.
Generation T shows you how to make every type of T-shirt from maternity styles to Halloween costumes. You'll also learn the art of arm-warmers and even how to embellish a picture frame. Since its launch, the blog has been so popular, it's grown into two books: In 2006, "Generation T: 108 Ways to Transform a T-Shirt" was published by Workman Publishing Co., followed in 2009 by her second book, "Generation T: Beyond Fashion: 120 New Ways to Transform a T-Shirt." Do you have some sparkling ideas of your own? Perhaps, like Marisa Lynch, you've been laid off and have some time on your hands. Maybe your friends regularly ask your style advice, or strangers approach you asking where you got your homemade jewelry? If so, it just might be time to start a blog. First, come up with your concept. Remember, blogging isn't necessarily about great writing; it can be anything you want, from a series of pictures to a daily project, like newdressaday.com. The main thing is to make it interesting and inspiring. If your aim is to make money from advertising on your blog, aim for a picture-led blog, as these tend to get more visits, which is essential for generating revenue. Next, search for other, similar-style blogs. See what works and what doesn't. Is their blog clear and easy to read? Is it pleasant to look at? What can you learn from others and how can you make your blog stand out? "I studied some of my favorite blogs and examined what it was about each of them that I loved," said style blogger Justina Blakeley. "I then took all of those pieces and channeled it into something totally mine." Once your blog is set up, blog regularly, and when you do, promote your posts via Facebook and Twitter to raise readership. Once you have a certain reach, you may even begin to make money from advertising. As Marisa Lynch, owner of the blog New Dress a Day, said: "This has become my full-time job. " Antonia Blyth began writing professionally in 1996. She has contributed to "British Marie Claire," "Us Weekly," "UK Elle," "Just Seventeen," dailymail.co.uk, "Red UK" and "Madison Australia." Blyth holds a Master of Arts in journalism from Goldsmiths University of London and a Bachelor of Arts in English Literature from University College London.